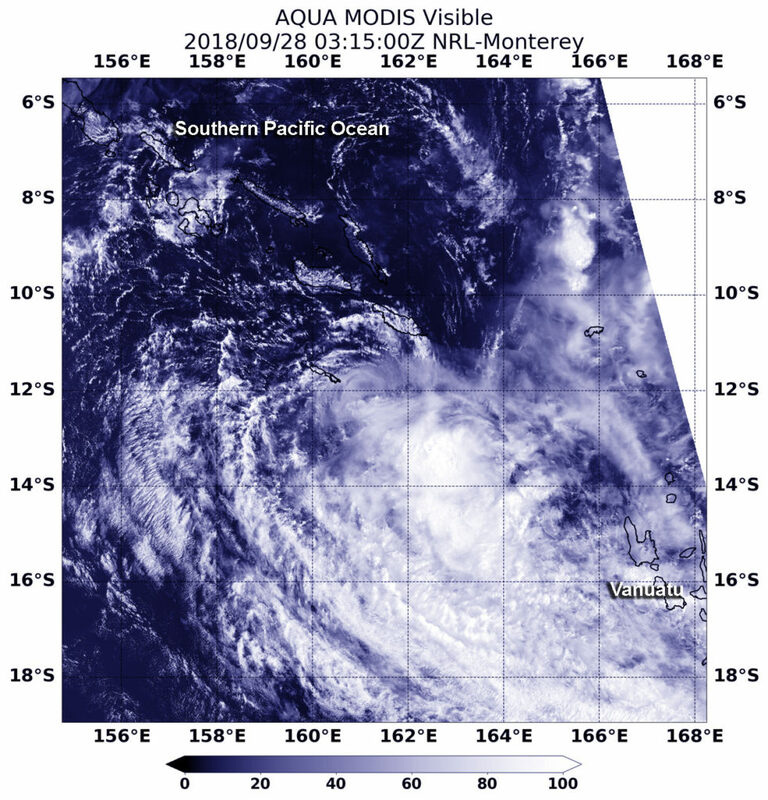 Visible imagery from NASA’s Aqua satellite revealed that strong wind shear was adversely affecting Tropical Cyclone Liua in the Southern Pacific Ocean. 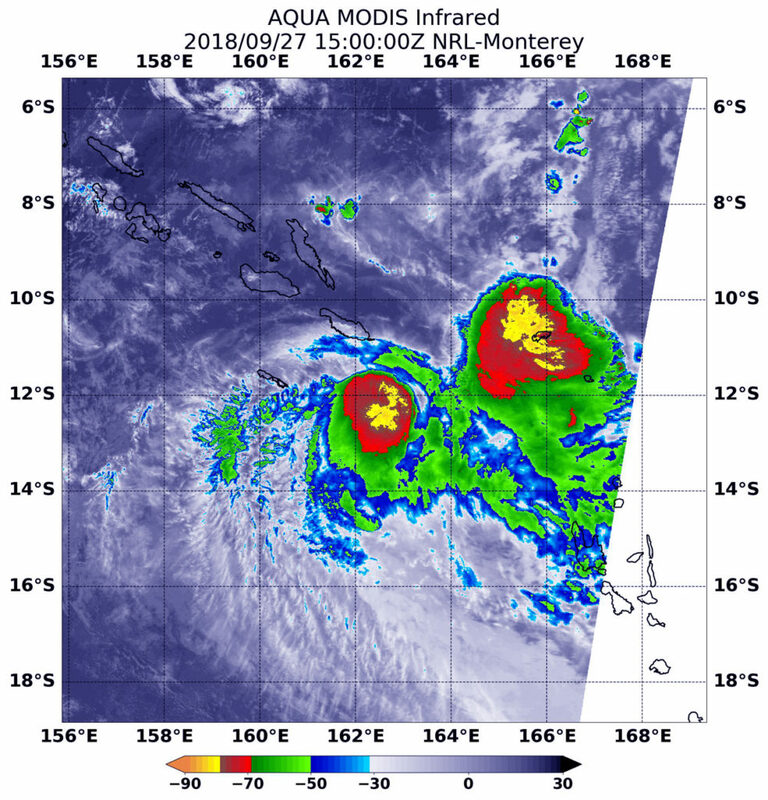 On Sept. 28 at 0315 UTC (Sept. 27 at 11:15 p.m. EDT) the Moderate Resolution Imaging Spectroradiometer or MODIS instrument aboard NASA’s Aqua satellite provided a visible image of Tropical Cyclone Liua. Liua appeared as a swirl of clouds around its center with most of its clouds and thunderstorms pushed southeast of center. Strong westerly to northwesterly vertical wind shear were tearing the storm apart. In general, wind shear is a measure of how the speed and direction of winds change with altitude. Tropical cyclones are like rotating cylinders of winds. Each level needs to be stacked on top each other vertically in order for the storm to maintain strength or intensify. Wind shear occurs when winds at different levels of the atmosphere push against the rotating cylinder of winds, weakening the rotation by pushing it apart at different levels. On Sept. 28, the Joint Typhoon Warning Center issued the final bulletin on Tropical Cyclone Liua. At that time, Liua was centered near 12.0 degrees south latitude and 161.1 degrees east longitude. That’s 540 miles northwest of Port Vila, Vanuatu. Liua was moving slowly to the west-northwest and had maximum sustained winds near 35 knots (40 mph/62 kph). Liua is forecast to dissipate under adverse atmospheric conditions.